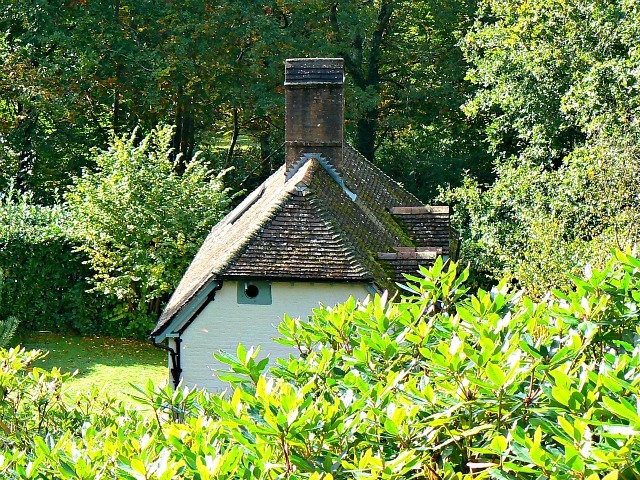 The cottage was built in 1808 as a farmworker's or forester's cottage and was used for that purpose for a little over a century until the outbreak of the Great War in 1914. It fell into disrepair and might well have been demolished had it not been rescued by a neighbour, Arthur Knowles, and one T E Lawrence, perhaps better known as Lawrence of Arabia, in 1922. Lawrence started by renting the cottage, eventually buying it in 1930. Because he was in the armed services for much of the period of his possession, Lawrence only lived there intermittently although another reason was that it took a lot of time (and money) to restore the property into a fit state. By early 1935 Lawrence was ready to retire and did so in February of that year. For various reasons he did not move into Clouds Hill until April. He was still planning and executing improvements to the cottage. The last significant job Lawrence carried out was the installation of a porthole, visible in this image under the gable end eaves. This was done at the end of April. The porthole came from a redundant Royal Navy warship, HMS Tiger. Sadly he was not to derive much benefit from his years of work. On Sunday 19th May 1935 Lawrence succumbed to injuries received in a motorcycle accident sustained the previous Monday, 13th May 1935 after a shopping trip to the nearby Bovington Camp. He was on the return journey and went off the road a mere 500 metres from the home he loved. © Copyright Brian Robert Marshall and licensed for reuse under this Creative Commons Licence.